I'm always on the lookout for new task managers that offer a different UI or a different approach to help me keep track of my seemingly endless to do list. The latest app to cross my path is 2Do for the Mac from Guided Ways technology. I was familiar with 2Do, having used their iOS app a few years ago when it launched. The tabbed interface of the iOS version never grabbed me, so I stopped using it after a few weeks. Late last year though, the company launched an OS X version, which was recently updated and overhauled. This latest Mac version (v.1.5.1) has brought me back into the 2Do fold. 2Do is a mid-tier task manager -- it's a step up from the Reminders app, but isn't as complex as Omnifocus. Very similar to Things, 2Do offers a nice balance between usefulness and simplicity. It's robust enough that you can use it to manage a large number of tasks and projects, but loose enough that you can adapt it to your own style of management. You're not pigeonholed into GTD or some other task management method. Rather than cover all the features of the app, which are too many to count, I wanted to point out a few features that'll keep me using 2Do for the foreseeable future. First and foremost is the app's smart list feature. This feature allows you create a custom list of tasks based upon search criteria such as tags. As the app review editor, I keep track of a lot of different apps for potential review. I tag every task and then use the smart list feature to group only iOS apps, only productivity apps or those apps assigned to my co-workers. It's a very flexible and powerful way of keeping track of a lot of tasks. Another aspect of 2Do I appreciate is how it approaches your tasks. Each individual task is more than just a simple note with a due date. You can add an image to your task, upload a file or attach an audio recording to help you remember unwritten details. 2Do supports status based on priority and tags, which are searchable within the app. You also can set a task to be recurring based on the days of the week, the days of the month or a set amount of time (every 4 days, for example). An alarm feature will remind you when your task is due, and you can choose when you want this gentle reminder to arrive. Last but not least is the Focus section in the app. This section sits in the left sidebar, which shows all your lists, smart lists, and a calendar. The Focus section is at the top, and it groups your upcoming and important tasks together. This is your central dashboard for the items that need your attention right away. It shows you all your tasks that are due today and highlights those that are overdue in red. This focus feature isn't unique to 2Do, other apps like Things have a similar focus section, but I am glad that Guided Ways decided to incorporate it into its app. It is extremely useful. Among the minor features, 2Do offers syncing across OS X and iOS devices so your task list will always be at your finger tips. It supports OS X Quick Look so you can highlight a task and tap your space bar to get an overview of your task. It also has a quick entry feature allowing you to add a task from any app. These are all small, but important items that increase your productivity. Note: If you use the default quick entry shortcut, you may lose the ability to access the new emoticons in OS X Mavericks as they both use the same Control-Command-Space shortcut. Just go into the preferences for 2Do and set your own custom keyboard shortcut. 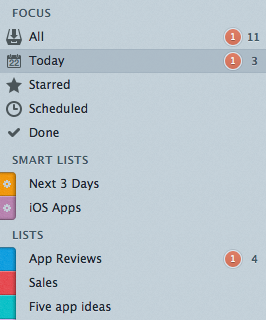 2Do is as capable as any task manager I have used, with the exception of Omnifocus, which is in a league of its own. 2Do is a great choice for 99% of the Mac owners who are looking for a robust task manager to handle a variety of home and work tasks. It has a long list of features and is intuitive enough to use that you don't have to pull out a manual every time you want to add something to your to-do list. 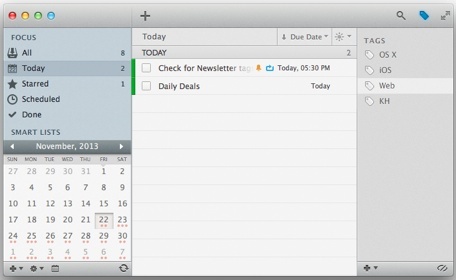 2Do is available from the Mac App Store for $39.99.